MAYOR JOHN TORY PROCLAIMS JUNE 14, 2018 AS “MASSEY HALL DAY”! (TORONTO, ON – June 14, 2018) – Massey Hall is thrilled to announce, that today Toronto Mayor John Tory has proclaimed June 14, 2018 “Massey Hall Day”! “Such an exciting day as we celebrate the 124 year cultural legacy of this National historic site with this proclamation and a night of powerful and inspiring Canadian performances,” said Deane Cameron, President and Chief Executive Officer, The Corporation of Massey Hall & Roy Thomson Hall. “We are weeks away before the temporary, two year closure of the hall but still have a lot to offer Torontonians before we close those iconic red doors. 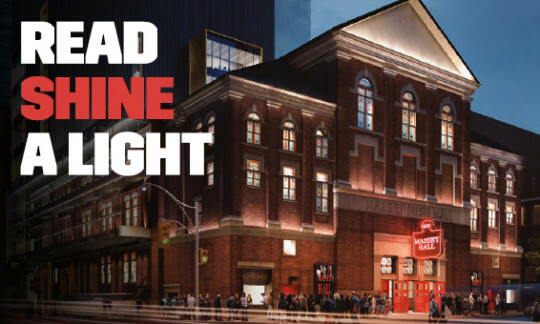 Come out and celebrate history with us!” The Massey Hall Forever public fundraising campaign launches today and calls upon all Toronto music fans and heritage preservationists to donate. Thanks to the exceptionally generous contributions of all three levels of Government and philanthropic leaders from the private sector, the $142 million Campaign has already secured $116 million, 82% of its goal. Dubbed “the people’s hall” by Hart Massey who gifted the venue to the citizens of Toronto in 1894, this iconic landmark now asks them join in protecting and celebrating Massey Hall’s heritage and building a lasting legacy for artists and fans alike. To make your contribution, visit www.masseyhall.com or Text-To-Donate by texting Massey to 80100. In more Massey Hall news, fans can now own a piece of music history as the venue’s legendary seats go on sale this Monday, June 18 at 12:00pm ET. Visit www. masseyhall.com for the latest information. Tonight, an all-star roster of Massey Hall alumni gather to perform on the iconic stage one last time before the hall temporarily closes for the Revitalization Project. Featuring performances by Jim Cuddy, Sarah Harmer, Joel Plaskett, Sam Roberts, Buffy Sainte-Marie, and Whitehorse who will be performing double-duty as house band for the evening. If music fans want to keep the Massey Hall celebrations alive, the newest Live at Massey Hall films premiered today featuring highly anticipated release of Emily Haines & The Soft Skeleton, Andy Shauf, Jennifer Castle and Born Ruffians. Watch them all at www.liveatmasseyhall.com. Massey Hall is one of Canada’s most revered cultural institutions and a designated National Historic Site. The iconic venue has hosted some of the greatest historical figures and contemporary artists including, Winston Churchill, Gordon Lightfoot, Helen Keller, Enrico Caruso, Neil Young, U2, Diana Krall, Oscar Peterson, Bob Dylan, Feist & Harry Styles. Built in 1894 by Hart Massey, Massey Hall was gifted to the citizens of Toronto and to this day, operates as a charitable not-for-profit organization. 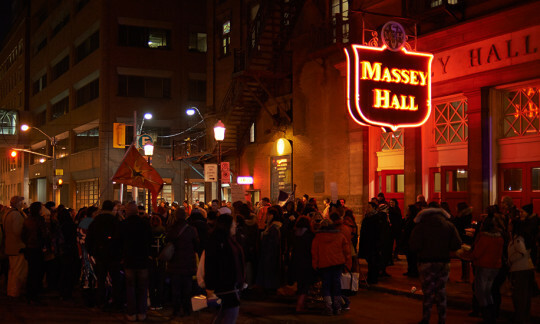 Remaining true to Massey’s vision, the organization devotes much of its focus on community outreach & education as well as artist development programs (such as Live at Massey Hall). In order to logistically & successfully accommodate these initiatives, Massey Hall is currently in the midst of a Revitalization to renew both the interior & exterior of the hall and the construct a new south tower - to ensure that the lives of Canadians continue to be enriched through arts, employment, and cultural celebration for generations to come.